Are the sculptures real bronze? Yes, the sculptures are made with real bronze. In the cold cast bronze process the bronze particles are suspended in a resin medium. When burnished the finish is identical to a sculpture 'hot cast' in a foundry with the advantage of a simpler and more flexible system leading to a more affordable product. All of Peter's sculptures are made of cold cast bronze except for Buff Copper this is made from cold cast copper. Delivery to the UK is completely free. Due to the weight of the bronze sculptures shipping is only free within the United Kingdom. The total cost of each sculpture with shipping to the appropriate location is contained in a drop down box please select the correct option before adding to the shopping cart. Yes we can. Simply enter the delivery address in the note field on checkout or simply contact us with your delivery details. Ordering is easy - we accept secure payment by credit/debit card with PayPal simply click on the add to cart button and enter your card details at checkout. When will my sculpture arrive and how is it shipped? Each sculpture is hand made to order by Peter we aim to dispatch within 10 days of purchase. All deliveries are made by courier and will require a signature. A a signature is required to confirm delivery we are unable to deliver to PO Boxes. What happens if a sculpture arrives broken? It is very important that you check the condition of the box on arrival if it looks as it has been damaged in transit please open the box and check the contents before signing for. If thee damage is not noticed until later please contact us as soon as possible and we can arrange for a replacement to be sent. Are limited edition sculptures numbered? You can ask for a particular number of an edition as long as it has not already been sold or reserved. A certificate of authenticity is supplied with every limited edition. Can the sculptures be kept outside? 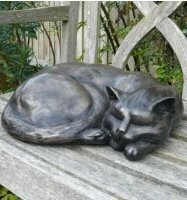 Yes all of the sculptures can be kept outside but over time with exposure to weather conditions the cats may develop a verdigris finish which can be cleaned if you wish by gently rubbing with wire wool.